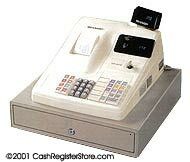 Sharp ER-A170 Electronic Cash Registers at Cash Register Store. The ER-A170 is full of convenient functions packed in a smart design. The ER-A170 has been pre-programmed at the factory to minimize setup time. Five departments are preset for taxable items. 100 standard PLU's (max. 200) are set up for subdepartment open entry. A clerk code entry key allows entry of up to four clerks through codes, clearly differentiating each clerk's daily activivies. Another useful feature is the flash report mode which can quickly display sales totals by department or for the whole store, as well as the amount of cash in the drawer. Drum type 3.0 lines per sec.